In the second half of “Snapdragon: a Riddle for a Flower Book” Newman continues with a short catalog of “rarer” or fancier flowers of favour (in contrast to the humble Snapdragon). Newman next lists various earthly goods, which have accompanying floral symbols, or emblems, after which he will return to the Snapdragon. Here the barren stone is decked by the Snapdragon, giving it green life … that is, “gracing” the stone, and softening the “rugged face” of the “human works,” the man-made walls. But then Newman has the Snapdragon claim something quite startling – the Snapdragon, while growing in stone walls, is displaying the “Unseen” to anyone who is in a “crowded public way;” A busy life might keep a person from thinking of God. – This is an important line. The “Unseen” that the Snapdragon is revealing, is God, or God’s will – Newman believes that Nature can point to the “Unseen” and participates by “beauty, grace, and perfection,” in God’s instrumentality, the dispensation of grace (PPS, 2:364). SHUT OUT – are the only words in the whole poem with two stressed syllables in a row – making them stand out dramatically, since the two stressed syllables, called a spondee, are surrounded by trochees. “Trinity had never been unkind to me. There used to be much snap-dragon growing on the walls opposite my freshman’s rooms there, and I had for years taken it as the emblem of my own perpetual residence even unto death in my University.” (A, 183). These verses are the expression of Newman’s desire to live and die at Oxford, in the simplicity of the life of a scholar, caring for the souls of his students. He thought for a time he would, since he was appointed a tutor at Oriel in 1826, a year before these verses. 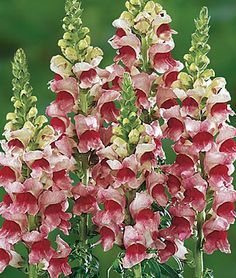 Just as the list of all the flowers were symbols or emblems of something else – the Snapdragon is the emblem of himself. The riddle is solved. But what of the “fragrance of the Syrian gale”? The Snapdragon releases its scent with a passing breeze, which for Newman expresses both humility and the Unseen … an act of submission by nature which will give evidence by fragrance to the Unseen, another metaphor for what John Henry desired for his life, through the emblem of the Snapdragon. We know Newman did not stay at Oxford; God had other plans. Later developments would take him from this life, to the greater glory of God and the world. The poems of John Henry Newman are often biographical, a fact which lends to poignancy to these verses. The backdrop to Snapdragon was his desire for academic distinction at Trinity College. After his failure to achieve this goal he gradually realized the importance of the virtue of humility, the simple role of a Snapdragon, able to display the Unseen in a crowded public way. For a while God answered his prayer allowing him to remain in the cloistered life of Oriel College as a tutor, before calling him to be a leading light in both the university education and religious life of Great Britain.